Willie Wilder's coach at Murray State Johnny Reagan marveled at his outfielder's dedication to catch a ball, according to The Evansville Press. That's because Wilder's dedication in this April 1988 game led him to run straight into a concrete block wall, The Press wrote. "You always hear about kids who play so hard they'd knock over a wall, but we got one here," Reagan told The Press of the play that sent Wilder to the hospital. Wilder recovered from that collision and, two years later, took his dedication to the pros. He played five pro seasons, but his dedication never got him to AA. Wilder's pro career began in 1990, taken by the Mariners in the 24th round of the draft out of Murray State. At Murray State, Wilder helped christen the club's Reagan Field in 1989, hitting the first Murray State home run at the facility. With the Mariners, Wilder started at short-season Bellingham. He got into 37 games and hit .152. He then returned to Bellingham and played at high-A Reno in 1991, but only saw 35 games on the season. He moved to high-A Peninsula for 1992. He knocked in a run in an April game, then two on a June single. He hit .245 overall in 110 games. 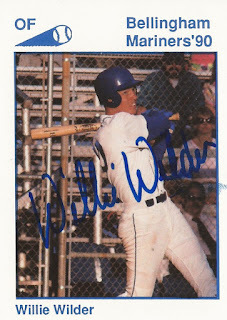 Wilder played 1993 at high-A Riverside. He saw 63 games and hit .275 to mark his last season in the Mariners system. He returned for one more season at independent Grays Harbor in 1995. He got into eight games to end his career.